Bruggen Blog: What's a graph without a laugh? 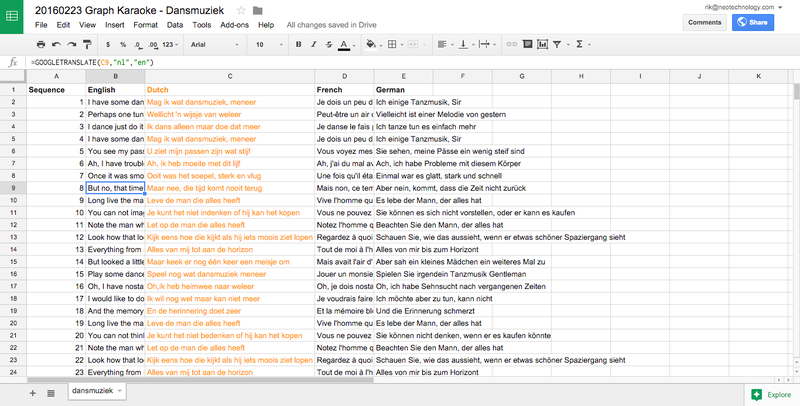 Multi-lingual Graph Karaoke is HERE! What's a graph without a laugh? 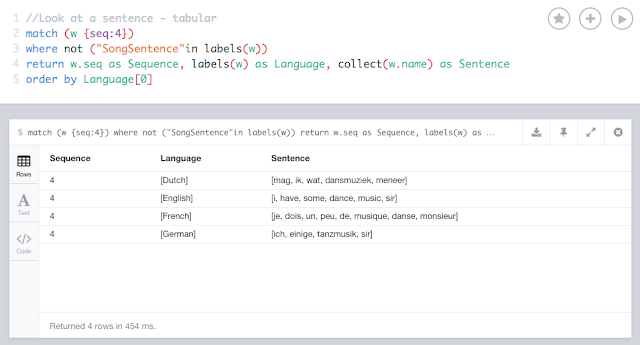 Multi-lingual Graph Karaoke is HERE! Indeed. 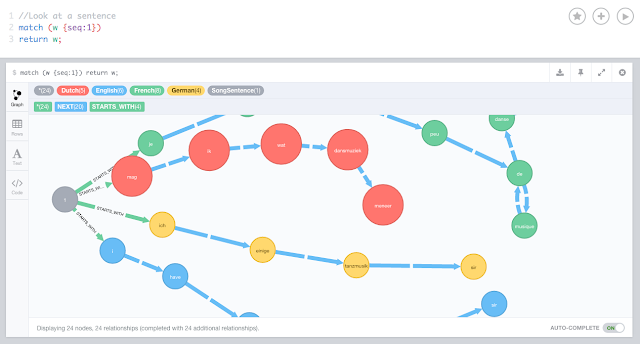 If you follow this blog and some of my work with Neo4j a little bit, then I am hoping you know that I like to have FUN with Neo4j as well. It's actually quite amazing that you CAN in fact have fun with something as "boring" as a database - but hey, I really think you can. And now with GraphConnect Europe coming up in April, I felt like we would really need some more songs to spice up the conference. But: being in Europe - WHY would we limit ourselves to boring ENGLISH songs all the time. 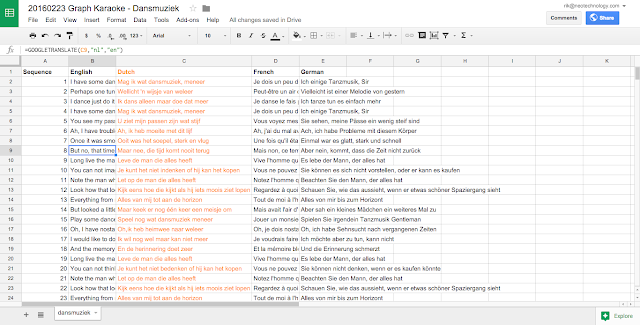 So I figured, there has to be a way to do Graph Karaoke in a multi-lingual way. And that's what I will be doing in the next few months - and today is the first episode in "MultiLingual Graph Karaoke". Google Sheets to the rescue! We'll start with a nice little Dutch song that I really like, by the world-famous (!) group "Doe Maar!". The song is "Dansmuziek", and has a lovely vibe to it, I think. and these lyrics get automatically translated into the other languages. Obviously the translations will not be perfect, but hey, at least you get to do multi-lingual graph karaoke then! Yey! Once I have this, I can download the spreadsheet as a CSV file, and then I can start working with it in Cypher. 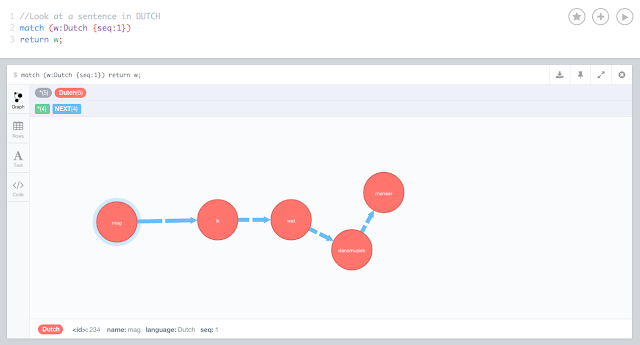 I have created an Import gist on Github - so you can basically run it yourself and import the graph at your own convenience. That's it! I plan make a few more of these before GraphConnect, and publish them here as well. If you have any "song requests" in your own language, then PLEASE let me know.